Troop 103 is one of the most active and fun troops in the area! We welcome new members to our troop at any time, whether new to Scouting, transitioning from Cubs, or transferring from another troop. Just attend a meeting, get to know our leaders and scouts, and join in the fun! We offer the Boy Scouts of America program to all boys in the community who are between the ages of 11 and 17, and to those who are not yet 11 but have completed fifth grade or earned the Arrow of Light. In order to officially join us, please complete the Registration Packet listed below. We will then give you a Scout Handbook, a Troop 103 neckerchief with a slide and you’re in! All the requested information is important to the Troop or BSA for various reasons - at least two very important ones - health and safety. The Youth Application form will be turned into the Pacific Skyline Council and will register your son with BSA on the National level. The Troop retains a copy of this completed form. Our Membership chairperson, Mrs. Kava, can supply you with a copy of this form or you can download the form, fill it out and bring us two signed copies. Please complete only Parts A and B of the Medical Form at this time. Make copies of front and back of your insurance card and submit with the form. This information is critical so that we are aware of any health/medical issues we may need to deal with and allows us to ensure the continued safety and good health of your son and the other scouts in the troop. The information on the Health Form will be kept strictly confidential at all times. Note: Parts A and B of the Health Form are required before going on any activity. Part C is required before attending any activity > 72 hours (i.e. summer camp) and must be completed by a certified and licensed physician, nurse practitioner, or a physician's assistant. Please complete the entire form for the parent who will most likely be attending our activities. Please include adult basic info, experience, references, questions and include your signature to verify and authorize a background check. Note: This is the same Health Form as for the scouts, but completed for adults participating in activities. Please make copies of front and back of your insurance card and submit with the form. 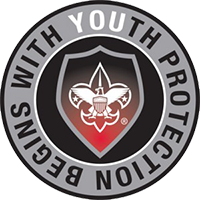 Per the Parent Committee decision from February 8, 2015, the YPT training needs to be completed by all parents of a scout in Troop 103. Certificates should be on file with the Troop and the Pacific Skyline Council. This very short training is free and available on-line. Your child may need assistance in setting up the registration online. Please assist. Please make the check payable to "Boy Scout Troop 103" in the amount of $195 if joining in September. If joining at any other time of the year, the prorated amount is $16.25 per month. This fee covers the period from September 1 to August 31. Oljato summer camp is a separate expense, as are admissions to activities, such as AdvanceCamp. Please make the check payable to "BSA" in the recommended amount of $185 or in any amount you can afford. We are hoping to get 100% participation regardless of the amount donated. For more information about the purpose of this request please click on Where does the money go? 9. Please bring the entire packet to our next Troop or Committee meeting.